A review of Exor Studio's Zombie Driver is somewhat redundant, since it's been available on PCs via Steam for almost three years. But as any dedicated mobile gamer knows, translating a console or PC gaming experience to a handheld is rarely as straightforward as developers or publishers think, and the $7 asking price is a respectable chunk of change, even for a proven game. 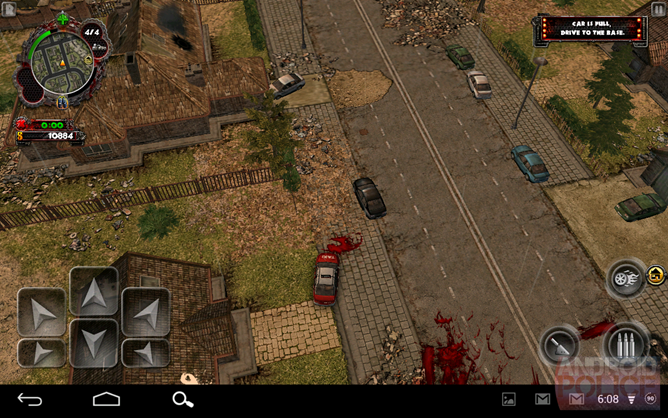 So, does the NVIDIA-published THD version of Zombie Driver live up to its undead-slaying progenitor? For the most part, yes. 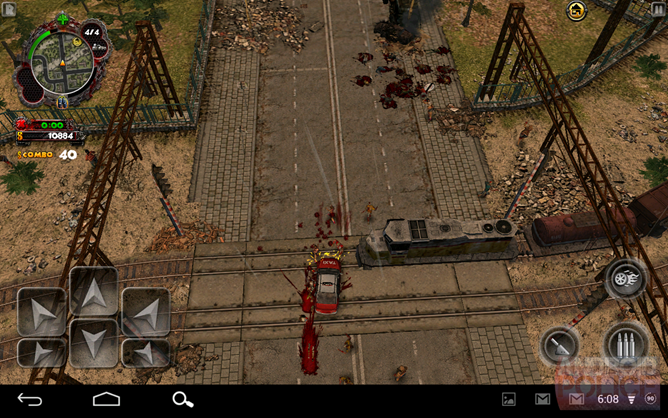 Zombie Driver THD keeps up the fast and surprisingly varied gameplay of the original, making only a few sacrifices to mobile controls (which, thankfully, are entirely optional). The impressive if somewhat drab graphics and obvious polish make the game a standout not just among the shambling hoard of zombie-themed titles available at the moment, but a solid entry to the action and driving genres as well. The premise for Zombie Driver is a familiar one: the undead have begun to spread, and you're a member of one of the last human holdouts just trying to survive in a military compound. 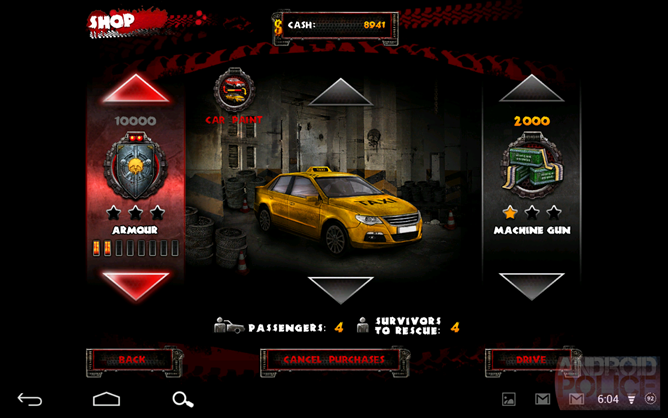 Since you're a hotshot driver (and expendable) the faceless commander assigns you to race out of the safe zone in a beaten-up cab and fight off the zombies surrounding the mayor's office. After discovering with some surprise that a 3,000-pound vehicle bristling with weapons and decked out with armor and nitrous is a pretty effective killing machine, you're given more missions. You'll have to rescue civilians, investigate undead goings-on, and kill many, many zombies, interspersed with massive boss battles. Outside of the Story mode, there's a surprising amount of replay packed into a standard racing mode and survival mode. The former feels like an old-school racing/combat game, where you're forced to reach the finish line first while contending with some of the weaker varieties of zombies, as well as other racers, all using weapons and upgrades. While less compelling initially, since you'll have to unlock vehicles and weapons in the story mode before purchasing them in race mode, the gradual progression makes racing more and more interesting as you go along. Speaking of unlocks: there are a lot of them. Most bonuses can be had by going through the story mode and accruing more cash for upgrades (why the military is making you buy machine guns, flamethrowers, and armor while surrounded by the undead is never fully explained). 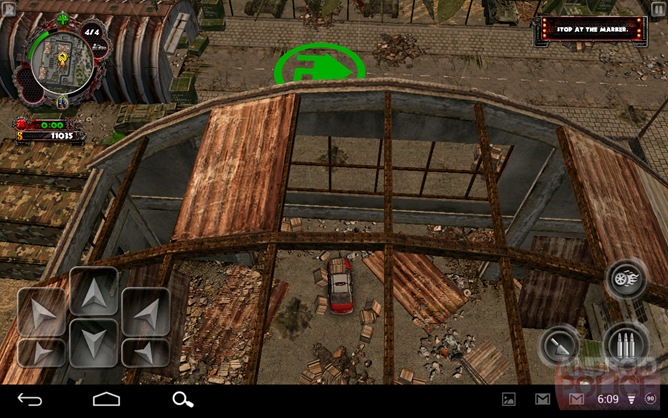 Bonus cars and other goodies can be acquired by completing secondary objectives, which occur on every mission. You can replay them if you can't get them the first time around, and thanks to a well-balanced difficulty curve, you won't be able to on many occasions. That's a good thing. Oh, and in case you're wondering, there's not an in-app purchase to be found: the $6.99 Zombie Driver is a complete game. Racing games have been one of the hardest genres to translate to mobile, since precise control doesn't do well with a digital D-pad. But since Zombie Driver is more of an action/adventure game in which your main character never gets out of his car, the developer tweaked the on-screen controls, providing a six-button steering layout instead of the standard virtual analog stick (though this is an option as well). Combined with a top-down play style and a responsive, dynamic camera, this makes for one of the most user-friendly racing games on Android. Tight turns and sudden reverses via the handbrake are easy to pull off. But that's not all, folks. 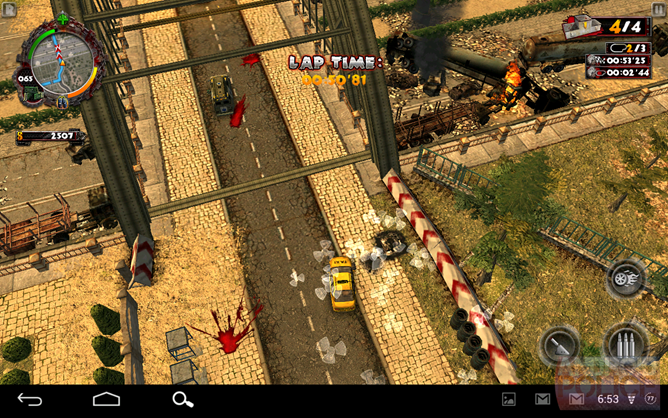 In addition to two on-screen button configurations, players are also given the choice to connect a controller or (a first that I've seen) a keyboard, to replicate the feeling of playing Zombie Driver on the PC. (Asus Transformer owners in particular should appreciate this.) 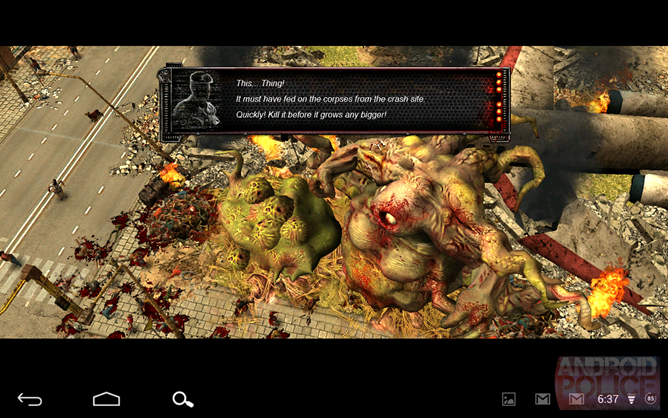 If you're a serious Android gamer who has one or both of these available, Zombie Driver is worth a look almost for the novelty alone. The gameplay itself is a strange mixture of driving and exploration. 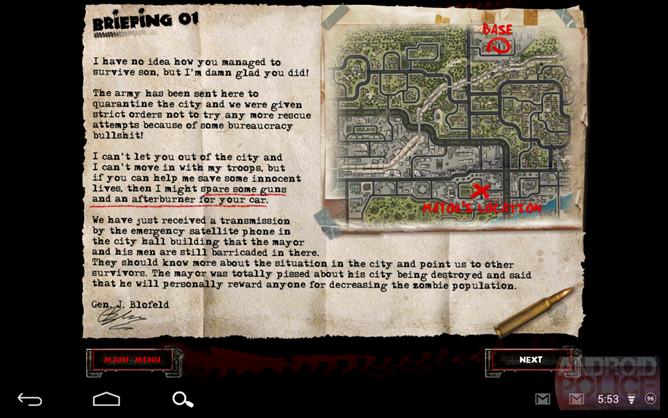 While navigating the city, zombies aren't actually that much of a threat; in common with games like Grand Theft Auto, the key is to learn the layout of the urban area so you can beat the clock to your objectives. Once you're assigned to kill so many zombies in an area or time limit, your car becomes the ultimate blunt instrument: during normal missions you'll run out of ammunition quickly, so use tight turns and lots of nitro to splat as many undead as you can. Boss battles and race mode switch the play style up a bit. 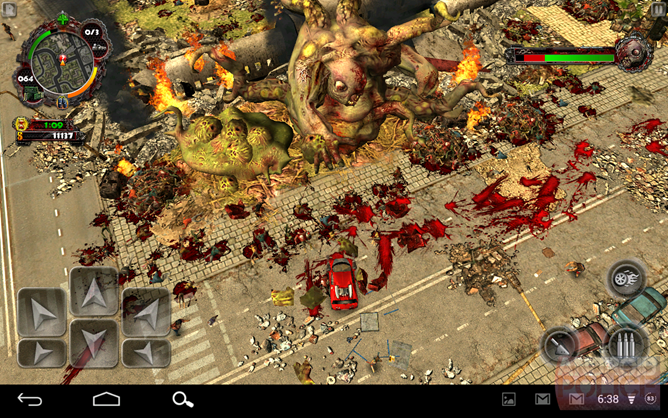 Fighting the various gigantic zombies that appear in the story is more of an exercise in control than anything else: you'll find plenty of heath and ammo around, just keep your headlights pointed at the bad guy and use all nine yards. 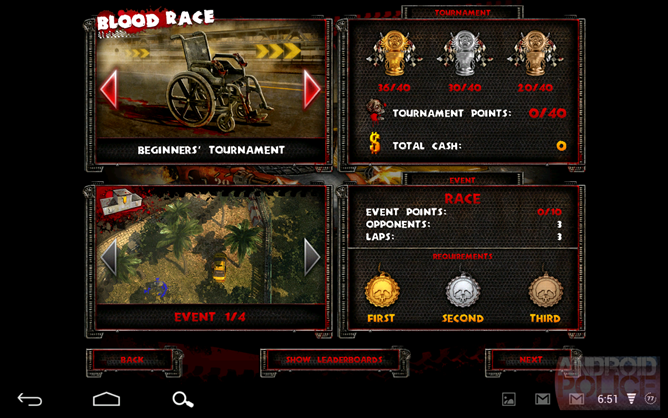 In Blood Race, the game switches to a macabre cart mode, where health and weapons respawn randomly on the track. Mario Kart players will know the drill here: pick up everything you can and use it quickly, before the players behind you can. One downside is that there's no multiplayer to be had, just leaderboards. 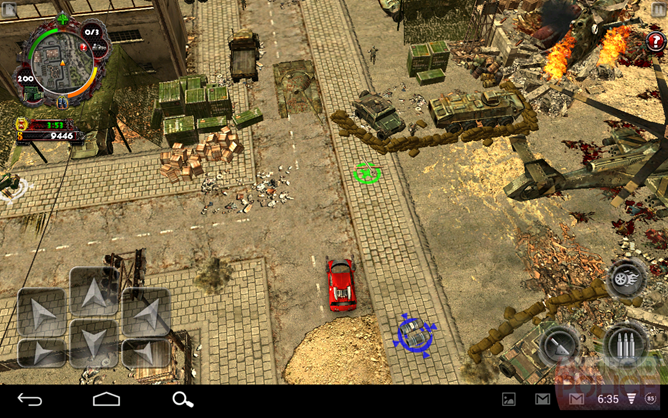 While Zombie Driver on the PC isn't going to tax any $500 graphics cards, the developers have still achieved the admirable task of creating a near-perfect replica for Android. 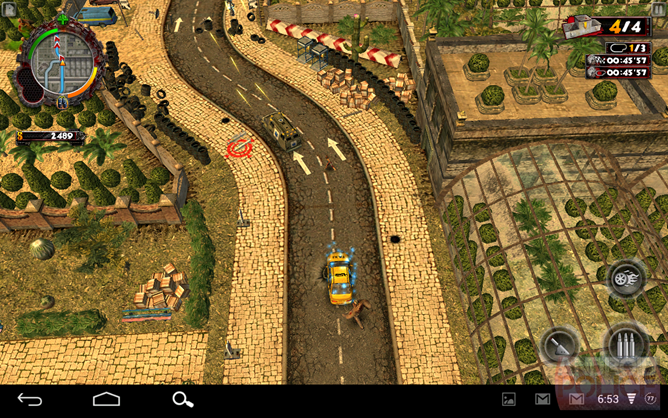 At least on my Nexus 7, the graphics appear identical to their PC counterparts minus a few polygons and shadows. Cars, lighting and dust effects, zombie splatter and weapons are all beautifully rendered. I daresay that older Tegra 2 hardware might not be able to push all these effects at once, but you should still be able to get the core experience. Surprisingly, the game is fully voice acted - everything from your encounters with (living) civilians and mission briefings to the "argh" and "ooooaaaaaa" of the zombies themselves gets the voice treatment. Music and sound effects are also solid, though pretty much everything except the gameplay itself is presented via static drawings. Unlike some of the other "THD" games (I'm looking at you, Fort Courage) Zombie Driver seems to justify both its exclusivity and its high price tag. I still wish there was a demo available - the large download will eat through your 15-minute trial period before you can run over your first walker. 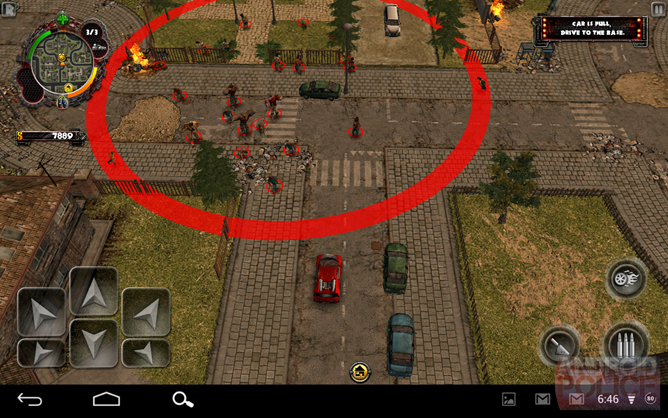 You can't hurl a flash-bang grenade on the Google Play Store without hitting some kind of a zombie game, but Zombie Driver absolutely stands out from the hoard. Fast, varied gameplay, great graphics, and plenty of replay via racing mode makes this the rare game that's worth a price tag over $5. 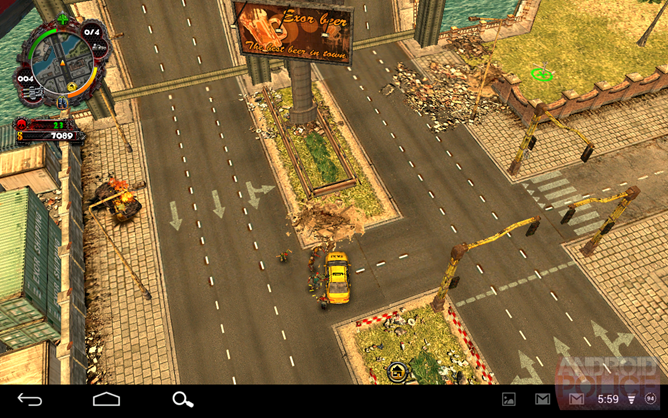 If you're looking for a showpiece for your Tegra 3 phone or tablet, this is it. Those without a love of racing (or the post-apocalyptic style that seems to be so popular these days) won't find a lot to justify their purchase, but anyone who's ever enjoyed a game of Ridge Racer or Twisted Metal will feel instantly at home. 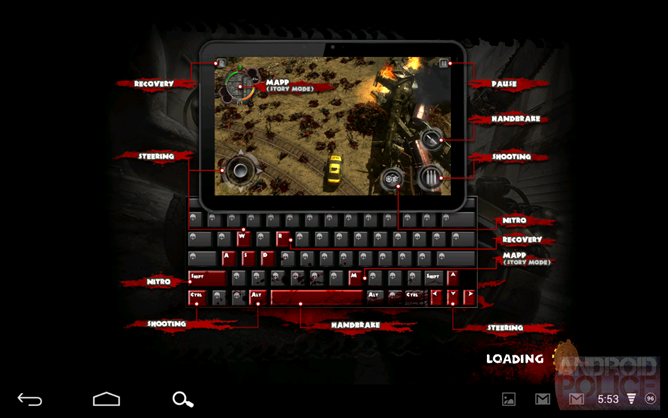 If you've got a Bluetooth keyboard or controller handy, you'll find Zombie Driver THD especially amenable to your gaming needs.